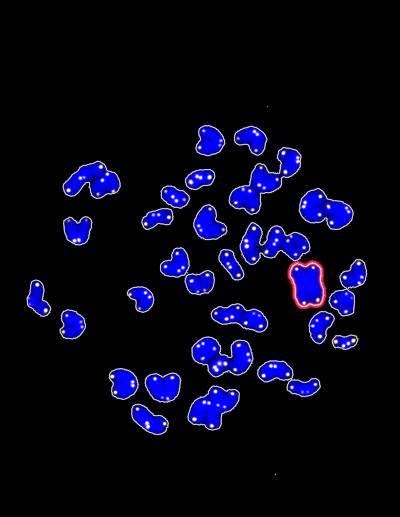 Using somatic cell nuclear transfer, a team of scientists led by Dr. Dieter Egli at the New York Stem Cell Foundation (NYSCF) Research Institute and Dr. Mark Sauer at Columbia University Medical Center has created the first disease-specific embryonic stem cell line with two sets of chromosomes. from a skin cell of the patient into a donor oocyte. 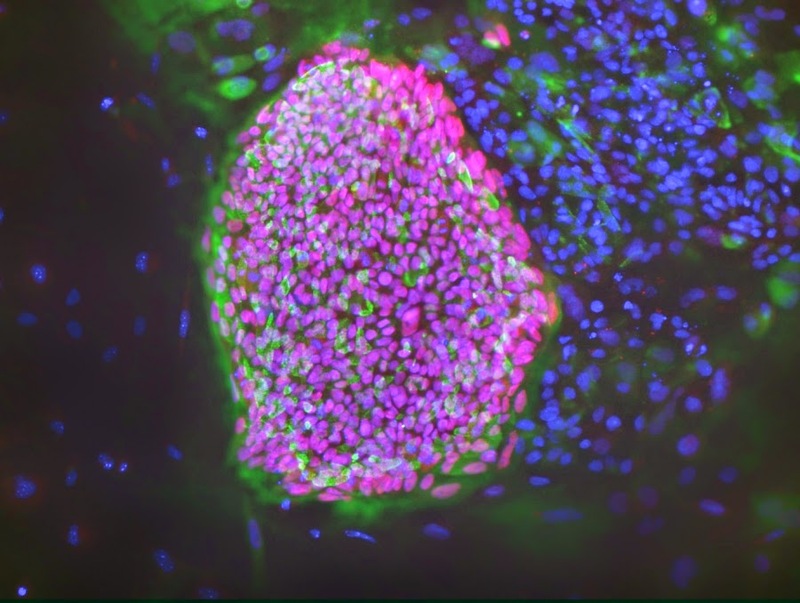 As reported today in Nature, the scientists derived embryonic stem cells by adding the nuclei of adult skin cells to unfertilized donor oocytes using a process called somatic cell nuclear transfer (SCNT). Embryonic stem cells were created from one adult donor with type 1 diabetes and a healthy control. In 2011, the team reported creating the first embryonic cell line from human skin using nuclear transfer when they made stem cells and insulin-producing beta cells from patients with type 1 diabetes. However, those stem cells were triploid, meaning they had three sets of chromosomes, and therefore could not be used for new therapies. The investigators overcame the final hurdle in making personalized stem cells that can be used to develop personalized cell therapies. They demonstrated the ability to make a patient-specific embryonic stem cell line that has two sets of chromosomes (a diploid state), the normal number in human cells. Reports from 2013 showed the ability to reprogram foetal fibroblasts using SCNT; however, this latest work demonstrates the first successful derivation by SCNT of diploid pluripotent stem cells from adult and neonatal somatic cells. "From the start, the goal of this work has been to make patient-specific stem cells from an adult human subject with type 1 diabetes that can give rise to the cells lost in the disease," said Dr. Egli, the NYSCF scientist who led the research and conducted many of the experiments. "By reprograming cells to a pluripotent state and making beta cells, we are now one step closer to being able to treat diabetic patients with their own insulin-producing cells." "I am thrilled to say we have accomplished our goal of creating patient-specific stem cells from diabetic patients using somatic cell nuclear transfer," said Susan L. Solomon, CEO and co-founder of NYSCF. "I became involved with medical research when my son was diagnosed with type 1 diabetes, and seeing today's results give me hope that we will one day have a cure for this debilitating disease. The NYSCF laboratory is one of the few places in the world that pursues all types of stem cell research. Even though many people questioned the necessity of continuing our SCNT work, we felt it was critical to advance all types of stem-cell research in pursuit of cures. We don't have a favourite cell type, and we don't yet know what kind of cell is going to be best for putting back into patients to treat their disease." The research is the culmination of an effort begun in 2006 to make patient-specific embryonic stem cell lines from patients with type 1 diabetes. Ms. Solomon opened NYSCF's privately funded laboratory on March 1, 2006, to facilitate the creation of type 1 diabetes patient-specific embryonic stem cells using SCNT. Initially, the stem cell experiments were done at Harvard and the skin biopsies from type 1 diabetic patients at Columbia; however, isolation of the cell nuclei from these skin biopsies could not be conducted in the federally funded laboratories at Columbia, necessitating a safe-haven laboratory to complete the research. NYSCF initially established its lab, now the largest independent stem cell laboratory in the nation, to serve as the site for this research. In 2008, all of the research was moved to the NYSCF laboratory when the Harvard scientists determined they could no longer move forward, as restrictions in Massachusetts prevented their obtaining oocytes. Dr. Egli left Harvard University and joined NYSCF; at the same time, NYSCF forged a collaboration with Dr. Sauer who designed a unique egg-donor program that allowed the scientists to obtain oocytes for the research. "This project is a great example of how enormous strides can be achieved when investigators in basic science and clinical medicine collaborate. I feel fortunate to have been able to participate in this important project," said Dr. Sauer. Dr. Sauer is vice chair of the Department of Obstetrics and Gynecology, professor of obstetrics and gynaecology, and chief of reproductive endocrinology at Columbia University Medical Center and program director of assisted reproduction at the Center for Women's Reproductive Care. Patients with type 1 diabetes lack insulin-producing beta cells, resulting in insulin deficiency and high blood-sugar levels. Therefore, producing beta cells from stem cells for transplantation holds promise as a treatment and potential cure for type 1 diabetes. Because the stem cells are made using a patient's own skin cells, the beta cells for replacement therapy would be autologous, or from the patient, matching the patient's DNA. Generating autologous beta cells using SCNT is only the first step in developing a complete cell replacement therapy for type 1 diabetes. In type 1 diabetes, the body's immune system attacks its own beta cells; therefore, further work is underway at NYSCF, Columbia, and other institutions to develop strategies to protect existing and therapeutic beta cells from attack by the immune system, as well as to prevent such attack. The technique described in the report published today can also be translated for use in the development of personalized autologous cell therapies for many other diseases and conditions including Parkinson's disease, macular degeneration, multiple sclerosis, and liver diseases and for replacing or repairing damaged bones. As part of the work, the scientists systematically analysed the factors that affect stem-cell derivation after SCNT. The reprogramming of skin cells from a type 1 diabetes patient by SCNT has long been sought, but has been challenging to achieve because of logistical difficulties in obtaining human oocytes for research, as well as an incomplete understanding of the biology of human oocytes. The scientists found that the addition of specific chemicals, called histone deacetylase inhibitors, and an efficient protocol for human oocyte activation were critical to achieving development to the stage at which embryonic stem cells are derived. These findings are consistent with the 2013 report by Tachibana and colleagues that used foetal cells. Though the authors of the 2013 paper also performed studies with cells of an infant with Leigh syndrome, they did not demonstrate that diploid pluripotent stem cells could be derived from these cells. Because foetal cells are less mature than the cells after birth, it was critical to determine if diploid pluripotent stem cells could be derived from the cells of both infants and adults. As an additional optimization of the SCNT protocol, the scientists found that it was important to maintain the integrity of the plasma membrane during manipulation, and that to do so, the agent used in the manipulations had to be at a low dose. The scientists applied this optimized protocol to skin cells of a male new-born and the cells of the adult patient with type 1 diabetes. From these two cell lines, the scientists produced a total of four SCNT-derived embryonic stem cell lines. All cell lines were diploid and could give rise to neurons, pancreatic cells, and cartilage, as well as various other cell types, demonstrating their pluripotency. Importantly, the cells of the type 1 diabetes patient also gave rise to insulin-producing beta cells. Therefore, this is the first report of the derivation of diploid pluripotent stem cells from a patient. And together with a paper published this month in Cell Stem Cell by Chung et al., it is also the first report of diploid embryonic stem cell lines derived from a human after birth. Dr. Nissim Benvenisty and his laboratory at Hebrew University of Jerusalem collaborated on this report by demonstrating that the cells produced were, in fact, embryonic stem cells by using microarrays to perform gene expression analysis of the cells. "This accomplishment is the product of an ongoing inter-institutional collaboration across scientific and clinical disciplines, supported by thoughtful philanthropy. The resulting technical and scientific insights bring closer the promise of cell replacement for a wide range of human disease." NYSCF continues pursuing SCNT research despite many scientific obstacles and in light of the advent of induced pluripotent stem (iPS) cells, as it is not yet clear which type of stem cells will prove best for personalized treatments. 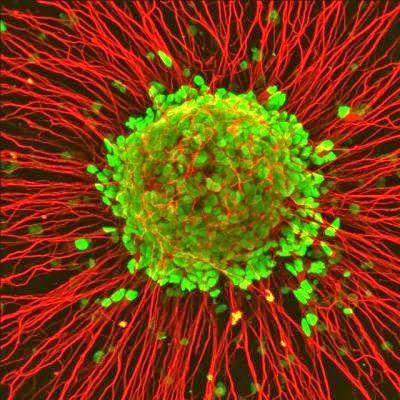 Many thought that iPS cells, first created from human cells in 2007, would replace the need for patient-specific embryonic stem cells because they allow patient- and disease-specific stem cell lines to be generated by genetically reprogramming adult cells into becoming pluripotent cells. However, it is not clear how similar iPS cells are to naturally occurring embryonic stem cells, which remain the gold standard, and what will be the preferred cell type for therapies. Though it is now possible to derive stem cell lines with a patient's genotype using iPS technology, the generation of stem cells using oocytes may have an advantage for use in cell replacement for diseases such as type 1 diabetes. The generation of pluripotent stem cell lines by SCNT uses human oocytes, while iPS cells use recombinant DNA, RNA, or chemicals, each of which requires its own safety testing and approval for clinical use. Human oocytes are already used routinely around the world to generate clinically relevant cells. The generation of pluripotent stem cell lines using human oocytes may therefore be particularly suitable for the development of cell-replacement therapies. Therefore, this work brings the scientists a significant step closer to this goal. Drs. Mitsutoshi Yamada and Bjarki Johannesson, postdoctoral fellows at the NYSCF Research Institute, were the co-first authors of the paper. A team of researchers in Korea who transplanted human neural stem cells (hNSCs) into the brains of nonhuman primates and assessed cell survival and differentiation after 22 and 24 months found that the hNSCs had differentiated into neurons at 24 months and did not cause tumours. The study will be published in a future issue of Cell Transplantation but is currently freely available on-line. The hNSCs were labelled with magnetic nanoparticles to enable them to be followed by magnetic resonance imaging (MRI). They did not use immunosuppressant’s. According to the researchers, their study is the first to evaluate and show the long-term survival and differentiation of hNSCs without the need for immunosuppression. The researchers concluded that hNSCs could be of "great value" as a source for cell replacement and gene transfer for the treatment of Parkinson's disease, Huntington's disease, Alzheimer's disease, amyotrophic lateral sclerosis (ALS), spinal cord injury and stroke. "Stroke is the fourth major cause of death in the US behind heart failure, cancer, and lower respiratory disease," said study co-author Dr. Seung U. Kim of University of British Columbia Hospital's department of neurology in Canada. "While tissue plasminogen activator (tPA) treatment within three hours after a stroke has shown good outcomes, stem cell therapy has the potential to address the treatment needs of those stroke patients for whom tPA treatment was unavailable or did not help." Dr. Kim and colleagues in Korea grafted magnetic particle-labelled hNSCs into the brains of laboratory primates and evaluated their performance to assess their survival and differentiation over 24 months. Of particular interest was determining their ability to differentiate into neurons and to determine whether the cells caused tumorigenesis. "We injected hNSCs into the frontal lobe and the putamen of the monkey brain because they are included in the middle cerebral artery (MCA) territory, which is the main target in the development of the ischemic lesion in animal stroke models," commented Dr. Kim. "Thus, research on survival and differentiation of hNSCs in the MCA territory should provide more meaningful information to cell transplantation in the MCA occlusion stroke model." The researchers said that they chose NSCs for transplantation because the existence of multipotent NSCs "has been known in developing rodents and in the human brain with the properties of indefinite growth and multipotent potential to differentiate" into the three major CNS cell types – neurons, astrocytes and oligodendrocytes. "The results of this study serve as a proof-of-principle and provide evidence that hNSCs transplanted into the non-human primate brain in the absence of immunosuppressant’s can survive and differentiate into neurons," wrote the researchers. "The study also serves as a preliminary study in our planned preclinical studies of hNSC transplantation in non-human primate stroke models." "The absence of tumours and differentiation of the transplanted cells into neurons in the absence of immunosuppression after transplantation into non-human primates provides hope that such a therapy could be applicable for use in humans." said Dr. Cesar V. Borlongan, Prof. of Neurosurgery and Director of the Center of Excellence for Aging & Brain Repair at the University of South Florida. "This is an encouraging study towards the use of NSCs to treat neurodegenerative disorders". Lee, S-R.; Lee, H. J.; Cha, S-H.; Jeong, K-J. ; Lee, Y. J.; Jeon, C-Y. ; Yi, K. S.; Lim, I.; Cho, Z-H.; Chang, K-T.; Kim, S. U. "The problem is that we don't know if these cells are really safe", says María Luigia De Bonis, a postdoctoral researcher of the Telomeres and Telomerase Group who has done a large part of the work. One year later, it was demonstrated that the levels of SIRT1 — a protein belonging to the sirtuin family and that is involved in the maintenance of telomeres, genomic stability and DNA damage response — are increased in embryonic stem cells. The question CNIO researchers asked was: is SIRT1 involved in cell reprogramming? "We observed cell reprogramming in the absence of SIRT1, but over time the produced iPS cells lengthen telomeres less efficiently and suffer from chromosome aberrations and DNA damage," says De Bonis. "SIRT1 helps iPS cells to remain healthy," she concludes. The authors describe how this protective effect on iPS cells is, in part, mediated by the cMYC regulator. SIRT1 slows the degradation of cMYC, which results in an increase in telomerase (the enzyme that increases telomere length) in cells. By studying nerve cells that originated in patients with a severe neurological disease, a University of Wisconsin-Madison researcher has pinpointed an error in protein formation that could be the root of amyotrophic lateral sclerosis. Also called Lou Gehrig's disease, ALS causes paralysis and death. According to the ALS Association, as many as 30,000 Americans are living with ALS. After a genetic mutation was discovered in a small group of ALS patients, scientists transferred that gene to animals and began to search for drugs that might treat those animals. But that approach has yet to work, says Su-Chun Zhang, a neuroscientist at the Waisman Center at UW-Madison, who is senior author of the new report, published April 3 in the journal Cell Stem Cell. Zhang has been using a different approach — studying diseased human cells in lab dishes. Those cells, called motor neurons, direct muscles to contract and are the site of failure in ALS. About 10 years ago, Zhang was the first in the world to grow motor neurons from human embryonic stem cells. More recently, he updated that approach by transforming skin cells into iPS (induced pluripotent stem) cells that were transformed, in turn, into motor neurons. IPS cells can be used as "disease models," as they carry many of the same traits as their donor. Zhang says the iPS approach offers a key advantage over the genetic approach, which "can only study the results of a known disease-causing gene. With iPS, you can take a cell from any patient, and grow up motor neurons that have ALS. That offers a new way to look at the basic disease pathology." In the new report, Zhang, Waisman scientist Hong Chen, and colleagues have pointed a finger at proteins that build a transport structure inside the motor neurons. Called neurofilament, this structure moves chemicals and cellular subunits to the far reaches of the nerve cell. The cargo needing movement includes neurotransmitters, which signal the muscles, and mitochondria, which process energy. Motor neurons that control foot muscles are about three feet long, so neurotransmitters must be moved a yard from their origin in the cell body to the location where they can signal the muscles, Zhang says. A patient lacking this connection becomes paralyzed; tellingly, the first sign of ALS is often paralysis in the feet and legs. Scientists have known for some time that in ALS, "tangles" along the nerve's projections, formed of misshapen protein, block the passage along the nerve fibres, eventually causing the nerve fibre to malfunction and die. The core of the new discovery is the source of these tangles: a shortage of one of the three proteins in the neurofilament. The neurofilament combines structural and functional roles, Zhang says. "Like the studs, joists and rafters of a house, the neurofilament is the backbone of the cell, but it's constantly changing. These proteins need to be shipped from the cell body, where they are produced, to the most distant part, and then be shipped back for recycling. If the proteins cannot form correctly and be transported easily, they form tangles that cause a cascade of problems." Finding neurofilament tangles in an autopsy of an ALS patient "will not tell you how they happen, when or why they happen," Zhang says. But with millions of cells — all carrying the human disease — to work with, Zhang's research group discovered the source of the tangles in the protein subunits that compose the neurofilaments. "Our discovery here is that the disease ALS is caused by mis-regulation of one step in the production of the neurofilament," he says. Beyond ALS, Zhang says "very similar tangles" appear in Alzheimer's and Parkinson's diseases. "We got really excited at the idea that when you study ALS, you may be looking at the root of many neurodegenerative disorders." “The motor neurons we reprogrammed from patient skin cells were relatively young, and we found that the mis-regulation happens very early, which means it is the most likely cause of this disease. Nobody knew this before, but we think if you can target this early step in pathology, you can potentially rescue the nerve cell." In the experiment just reported, Zhang found a way to rescue the neural cells living in his lab dishes. When his group "edited" the gene that directs formation of the deficient protein, "suddenly the cells looked normal," Zhang says. Already, he reports, scientists at the Small Molecule Screening and Synthesis Facility at UW-Madison are looking for a way to rescue diseased motor neurons. These neurons are made by the millions from stem cells using techniques that Zhang has perfected over the years. Zhang says "libraries" of candidate drugs, each containing a thousand or more compounds, are being tested. "This is exciting. We can put this into action right away. The basic research is now starting to pay off. With a disease like this, there is no time to waste." Harvard stem cell scientists have discovered that a recently approved medication for epilepsy may possibly be a meaningful treatment for amyotrophic lateral sclerosis (ALS) — Lou Gehrig's disease, a uniformly fatal neurodegenerative disorder. The researchers are now collaborating with Massachusetts General Hospital to design an initial clinical trial testing the safety of the treatment in ALS patients. Now Eggan and HSCI colleague Clifford Woolf, MD, PhD, have found that the many independent mutations that cause ALS may be linked by their ability to trigger abnormally high activity in motor neurons. Using neurons derived from stem cells made from ALS patient skin cells, the two research teams conducted clinical trials of the anti-epilepsy medication on neurons in laboratory dishes, finding that it reduced the hyper-excitability of the cells. "The big problem in ALS is that there are more than a hundred mutations in dozens of genes that all cause the disease, but almost all of the therapeutics that have gone forward in the clinic have done so for just one of those mutations, SOD1, which almost everyone studies in mice," said Eggan, a professor in Harvard's Department of Stem and Regenerative Biology. "And so, the key question that we really wanted to address was — are clinical efforts failing because the mouse is taking us on a wild goose chase, or is it simply that people haven't had the opportunity to pre-test whether their ideas are true across lots of forms of ALS? ", he continued. "We found that the mutation makes changes in the motor neurons, which aren't so different from the changes that you see in the mice," Eggan said. "I think our paper says that while there are definitely some human-specific biology, the mice weren't totally misleading." Eggan's lab then created more stem cell-derived motor neurons from patients with another form of ALS, as well as people without the disease, to see what changes occur in ALS cells and if these were present across independent genetic mutations. The ALS hyper-excitability was further examined by Woolf's team, led by Harvard Medical School neurologist Brian Wainger, MD, PhD. Working with Eggan and Kiskinis collectively, they found a cyclical relationship between the increased neuron activity and abnormal protein folding. In the two papers, they describe how the over-excitable ALS neurons generate more abnormally folded proteins, further increasing their excitability. The strain of this cycle seems to put the neurons in a vulnerable state where they are more likely to die. "The convergence on a single mechanism offered a very attractive place to intervene therapeutically," said Woolf, a Harvard Medical School professor in neurology and neurobiology at Boston Children's Hospital, who also co-leads HSCI's Nervous System Diseases Program. "It looked like there's a deficit in potassium channels in the ALS motor neurons and that led us to then test whether drugs that open the potassium channels may reduce this hyper-excitability — and indeed that's exactly what we found," he said. "We found that retigabine, which has recently been approved as an anticonvulsive, normalized this activity; so now we can formally go from the dish to the patient and actually explore whether the drug might have any beneficial effect." "The whole intact nervous system is more complicated than the cells that we have in the dish at the moment," Eggan said. "And now the next step is to say whether or not the drug will be helpful in that context, and it's too early to say for sure." "I think it's the beginning of a complete change in the way we do medicine for serious diseases like this," Woolf said. "In a traditional clinical trial, you give the patient the placebo or an active ingredient to see the effects they have and it's over. Here we can take the same stem cell lines and have an infinite capacity to do clinical trials in a dish." The mammalian heart has generally been considered to lack the ability to repair itself after injury, but a 2011 study in new-born mice challenged this view, providing evidence for complete regeneration after resection of 10% of the apex, the lowest part of the heart. In a study published by Cell Press in Stem Cell Reports on April 3, 2014, researchers attempted to replicate these recent findings but failed to uncover any evidence of complete heart regeneration in new-born mice that underwent apex resection. "Our results question the usefulness of the apex resection model for identifying molecular mechanisms underlying heart regeneration after damage and underscore the need for the scientific community to firmly establish whether or not the mammalian heart is capable of regeneration," says lead study author Ditte Andersen of Odense University Hospital and the University of Southern Denmark. formation with connective tissue and fat is seen. Credit: Stem Cell Reports, Andersen et al..
Cardiovascular disease is currently one of the leading causes of death worldwide, and scientists have mainly attributed this high mortality rate to the inability of the mammalian heart to regenerate after injury. Novel therapies capable of enhancing the heart's ability to recover after a heart attack or other type of injury are urgently needed. That's why a 2011 Science report from Porrello et al. 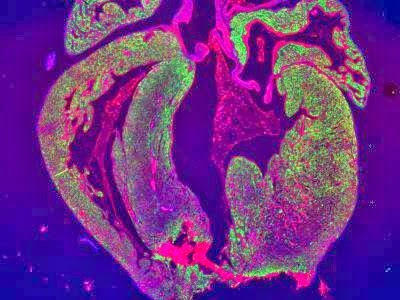 that provided evidence of complete heart regeneration in new-born mice attracted a great deal of attention and raised hopes for identifying factors that could improve heart regeneration. lined by a scar composed of Collagen (red). This study prompted Andersen, Søren Sheikh, and their colleagues to look for factors that enable heart regeneration, but they were surprised to find no signs of true heart regeneration in new-born mice that underwent apex resection. Three weeks after this procedure, the damaged hearts were about 10% shorter and weighed 14% less than the hearts of control mice that underwent the same surgical procedure without apex resection. Moreover, the damaged hearts had large scars and lacked proliferating muscle cells crucial for restoring heart function. 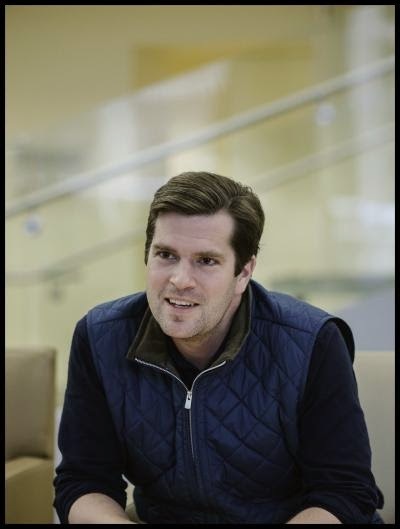 "The notion of mammalian heart regeneration has given a lot of hope in the scientific community for finding important factors that may be used for improving adult heart regeneration," Andersen says. "We hope that our study will add another view on this important matter and spur a lot of studies from other independent labs that may shed further light on this controversial area of research." Do Neonatal Mouse Hearts Regenerate following Heart Apex Resection? the screen.) Credit: L. Brian Stauffer. Researchers report they can generate human motor neurons from stem cells much more quickly and efficiently than previous methods allowed. The finding, described in Nature Communications, will aid efforts to model human motor neuron development, and to understand and treat spinal cord injuries and motor neuron diseases such as amyotrophic lateral sclerosis (ALS). The new method involves adding critical signalling molecules to precursor cells a few days earlier than previous methods specified. This increases the proportion of healthy motor neurons derived from stem cells (from 30 to 70 percent) and cuts in half the time required to do so. "We would argue that whatever happens in the human body is going to be quite efficient, quite rapid," said University of Illinois cell and developmental biology professor Fei Wang, who led the study with visiting scholar Qiuhao Qu and materials science and engineering professor Jianjun Cheng. "Previous approaches took 40 to 50 days, and then the efficiency was very low – 20 to 30 percent. So it's unlikely that those methods recreate human motor neuron development." Qu's method produced a much larger population of mature, functional motor neurons in 20 days. 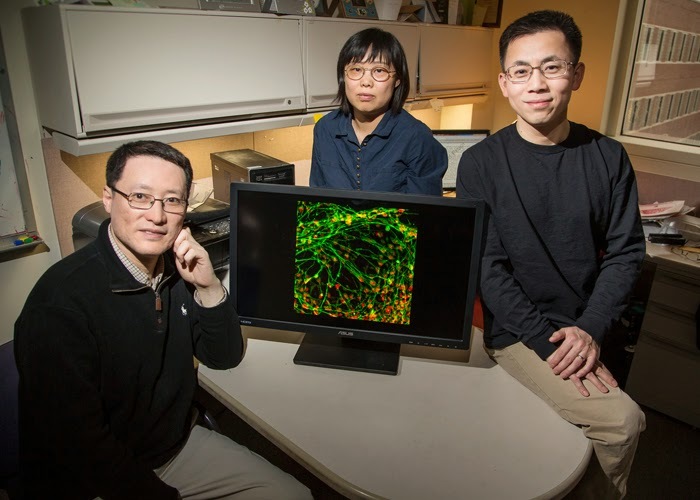 The new approach will allow scientists to induce mature human motor neuron development in cell culture, and to identify the factors that are vital to that process, Wang said. Stem cells are unique in that they can adopt the shape and function of a variety of cell types. Generating neurons from stem cells (either embryonic stem cells or those "induced" to revert back to an embryo-like state) requires adding signalling molecules to the cells at critical moments in their development. Wang and other colleagues previously discovered a molecule (called compound C) that converts stem cells into "neural progenitor cells," an early stage in the cells' development into neurons. But further coaxing these cells to become motor neurons presented unusual challenges. Previous studies added two important signalling molecules at Day 6 (six days after exposure to compound C), but with limited success in generating motor neurons. In the new study, Qu discovered that adding the signalling molecules at Day 3 worked much better: The neural progenitor cells quickly and efficiently differentiated into motor neurons. This indicates that Day 3 represents a previously unrecognized neural progenitor cell stage, Wang said. The new approach has immediate applications in the lab. Watching how stem cells (derived from ALS patients' own skin cells, for example) develop into motor neurons will offer new insights into disease processes, and any method that improves the speed and efficiency of generating the motor neurons will aid scientists. The cells can also be used to screen for drugs to treat motor neuron diseases, and may one day be used therapeutically to restore lost function. "To have a rapid, efficient way to generate motor neurons will undoubtedly be crucial to studying – and potentially also treating – spinal cord injuries and diseases like ALS," Wang said.